I’m more than happy to travel to the other side of Sydney to enjoy authentic Naples style pizza (see for example Da Orazio Pizza + Porchetta). I even flew to Melbourne attracted by the prospect of feasting on the ‘world’s best’ Margherita (see 400 Gradi). 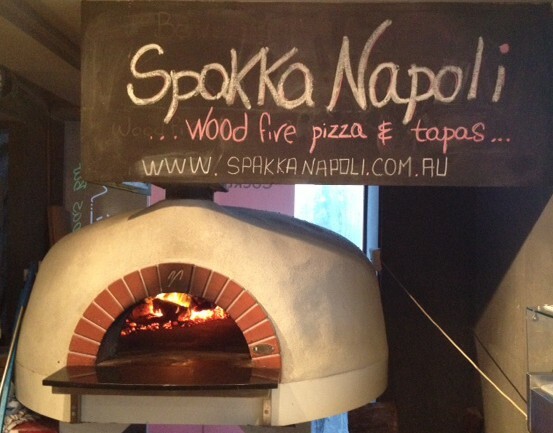 So when I realised that Spakka Napoli is just around the corner in Neutral Bay I got excited. Especially because Danny and Gigi, the owners of Spakka Napoli, are originally from Naples. My experience of Italy is that some of the most authentic restaurants sit hidden away, out of reach of all but the most discerning tourists. The same is true for Spakka Napoli – it’s located on the first floor of a rather ordinary mixed use building one street back from Military Road. It’s busy not because of passing trade – but rather because the word has spread with locals that there’s a new place serving reasonably priced tapas, pasta and pizzas made with lots of Italian amore. 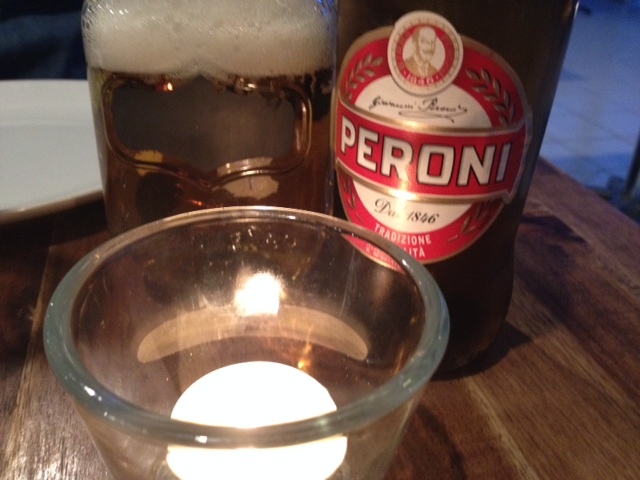 Although Spakka Napoli has a very affordable drinks list covering cocktails, beer and wine, it also offers BYO. As I walked into the restaurant, bottle of red in hand, I was greeted by Danny and seated at the perfect table with a prime view of the wood fire pizza oven. We decided to start with a couple of tapas before moving onto pizza. Tapas are strictly speaking Spanish and so may seem out of place in an Italian but the name tapas at Spakka Napoli is an indication of the size rather than the origin of the dishes. 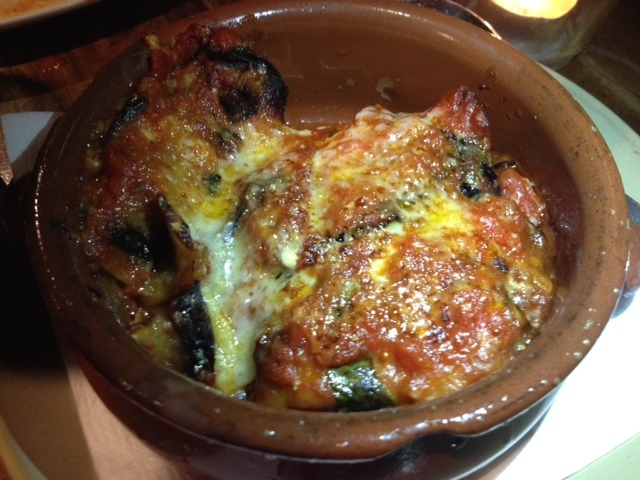 After reviewing the selection I decided to try their tapas version of two dishes that I often make at home – meatballs and eggplant parmigiana. 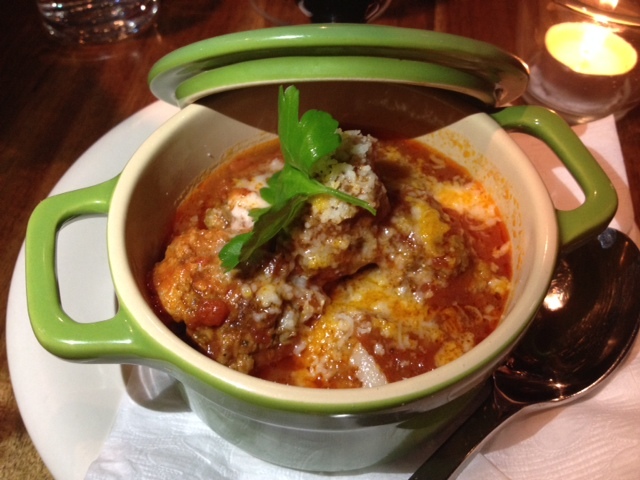 The meatballs are juicy and bite sized with just enough sauce and a little cheese. 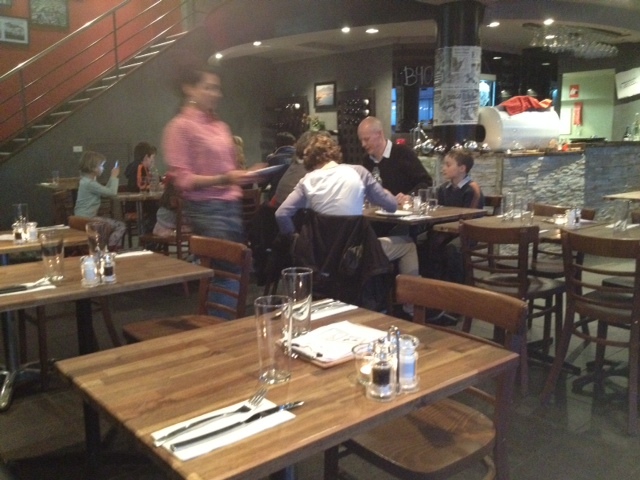 The menu tells you that they’re made ‘like mum taught us’, which gives them instant credibility. The only downside is that they disappear so quickly. If you’re a pasta lover, or simply want more meatballs, you can enjoy them as a main with spaghetti. Onto the pizza. If I had a smaller appetite then I’d be raving here about how at Spakka Napoli you can choose a ‘Half & Half’ pizza for $25 (a combination of any two toppings). 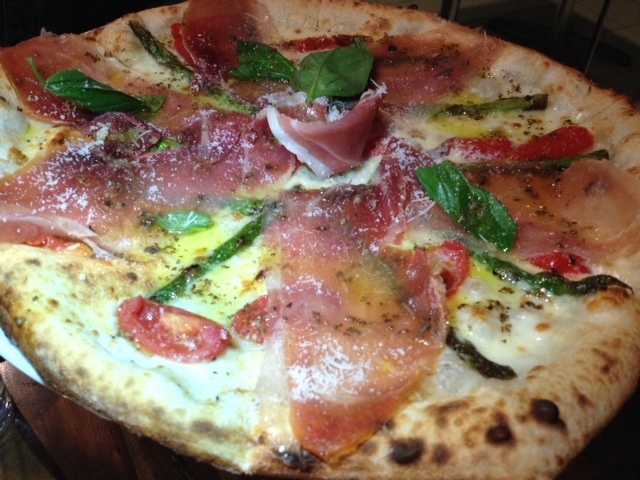 But knowing that I never have any trouble finishing a whole pizza I choose the ‘pizza special’ – which made great use of Australian asparagus that had just come back into season. And my husband opted for the vegetarian ‘Via Spiga’. In reality as always we shared both. 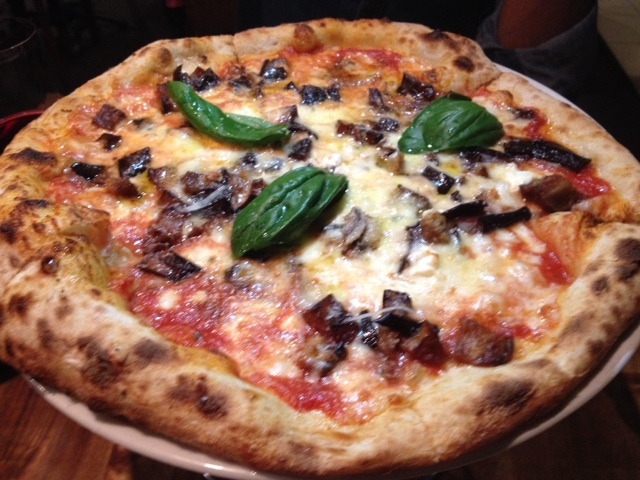 The pizzas really did exceed my expectations – a big call considering recent visits to 400 Gradi & Da Orazio, two spots renowned for their Naples style pizza authenticity. At Spakka Napoli the dough is soft and light, the edges just crispy enough and the toppings generous without being overly cheesy. Do note though there’s one caveat to ensure you really do walk away with a true appreciation of Napoli style pizza. What is it? Don’t even consider ordering the ‘thin & crispy’ version that’s offered as an alternative style of base. As for dessert yes there’s a good menu with classic Italian temptations like tiramisu and affogato. If you can stomach any more pizza for opted for pasta for main then you can even satisfy your sweet tooth with the nutella pizza with whipped cream & strawberry. On this occasion I held out. Thanks Spakka Napoli for a memorable pizza feast – I’ll be back. If you’re a local and want to try Spakka Napoli’s pizzas without leaving home then the good news is they do free home delivery. Visit on a Tuesday or Wednesday and enjoy a pizza & beer for only $20. They have a good sized private room upstairs that’s popular for birthdays and functions. Tags: BYO, Italian, Neutral Bay, pasta, pizza, pizzeria, Spakka Napoli. Bookmark the permalink. Great pizza made at a great pizzeria can’t be beat. But if you want to make excellent pizza at home as well, it is fairly easy to do. Check it out and let me know what you think. Yes I agree I also have a post at Feast Wisely on making pizza dough at home – it’s so easy. I love, especially the pizza. It looks fresh and delicious!